“RANG Heifers? What kind of breed is that?” Dad said. “No idea. Maybe it stands for range?” I said. We were looking at a sale report from March 19th for Monroe, Wisconsin. The best-selling Angus heifers brought $93.50 per hundred lbs. at an average weight of 682 lbs. The best-selling Angus steers brought $99 per hundred lbs. at an average weight of 750 lbs. The best-selling Crossbred heifers brought $93 per hundred lbs. at an average weight of 682 lbs. The RANG cattle blew them out of the water. 653 lb. heifers brought $102 per hundred lbs. 757 lb. steers brought $105 per hundred lbs. That’s about 50 dollars higher per head. We had topped the March 12th sale at Bloomington, Wisconsin. Our red heifers brought $102.50 at an average weight of 666 lbs. Our heifers are not purebred. Dad raised Shorthorns all his life as his Dad did before him. We grew disgusted, however, with the Shorthorn breed’s emphasis on the showring and the addition of Maine-Anjou genetics to the Shorthorn breed in the 90’s. We tried using Maine/Shorthorn bulls; but decided to do something different when we found ourselves pulling big, dead, calves out of cows. 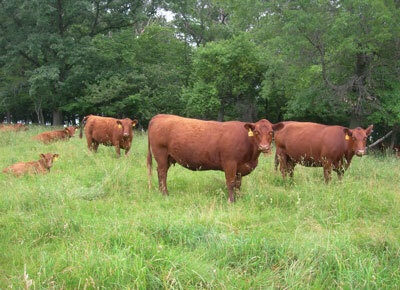 We started using Red Angus bulls. Rah-rah Red Angus! Calving ease improved and raising cattle was fun again. This entry was posted on Monday, March 29th, 2010 at 11:31 am and is filed under Curious cattle. You can follow any responses to this entry through the RSS 2.0 feed. You can leave a response, or trackback from your own site.